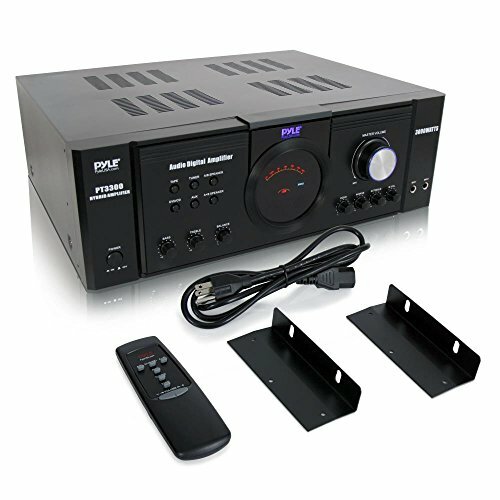 The Pyle PT3300 3000-Watt Hybrid Power Amplifier is rack mountable! It's a great addition to your equipment and provides big, punchy sounds with a wide dynamic frequency range, so it's perfect for music, voice & even movie viewing! It supports 4 RCA inputs - a true multitasker - and outputs to two sets of speakers, with an A/B selector. Plug in up to two microphones using the front ¼” jacks. Easily adjust the treble, bass, and balance with the front-mounted rotary faders. This amp even has an echo effect for the microphones. The master volume control looks great, too, thanks to the Blue LED effect. Runs on 110V or 220V. DISPLAY METER: The new & improved compact & rack mountable bookshelf amplifier has a built-in VFD display meter which measures the decibels & shows which input is used. A remote control is also included in the package for distant audio adjustments. WORRY-FREE SHOPPING: With the Pyle PT3300 updated version, we are confident of the quality of our product, therefore, we offer a 30-day money-back guarantee, no questions asked.